New Journal: "Studies in Digital Heritage"
The new journal Studies in Digital Heritage (studiesdh.org) will publish "articles showing how technology can support innovative research across the traditional fields of cultural heritage," as described by the journal's founders Dr. Bernard Frischer and Dr. Gabriele Guidi, and managing editor Kelly McClinton, in a blog post announcing the journal. 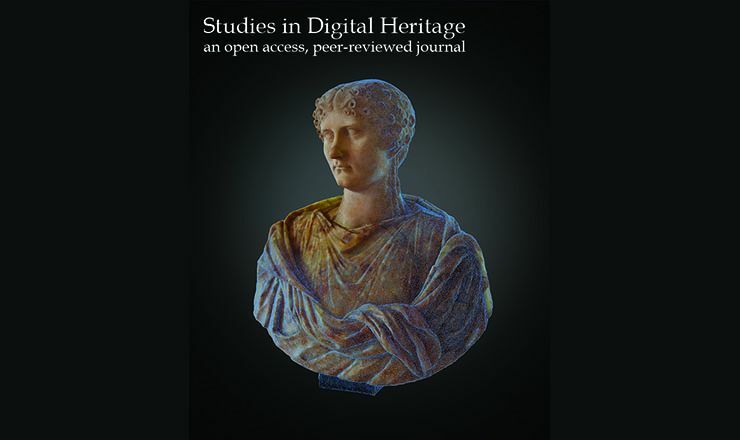 As an open access journal, Studies in Digital Heritage has no subscription fee for either individuals or institutions, but the editors do encourage scholars and libraries to subscribe to the journal in order to develop readership raise its impact factor. You may subscribe here. The journal will include 3D models, and will "implement a modern WebGL solution to support embedded interactive 3D models within an article, ideally on the same page as where they are discussed or used as illustrations of a point." For scholars interested in publishing in the journal, guidelines can be found here. Cover image of journal: Rendering by Dennis Hill (Indiana University) showing the 3D model of a bust of Agrippina Minor in the Uffizi Gallery (inventory nr. nr. 115; Italian marble; Ht: 0.58 m).